To provide compassionate, high quality care for our patients and their families through advanced diagnostics and treatments, continuing staff training and most importantly through educating our clients so that they can make informed decisions regarding their pet’s health care. Adhere to our Patient and Client Bill of Rights without fail: Treat all pets as a cherished member of their human families. Adhere to our Staff and Hospital Bill of Rights without fail: Maintain a professional environment of mutual respect where we continually improve our skills and assist and support one another. Provide educational links to our clients, our profession and our community at large that effectively advocates for the highest value care of our animal friends. Maintain and improve AAHA-accredited status; be a leader for AAHA. Be a standard of excellence for the veterinary community. 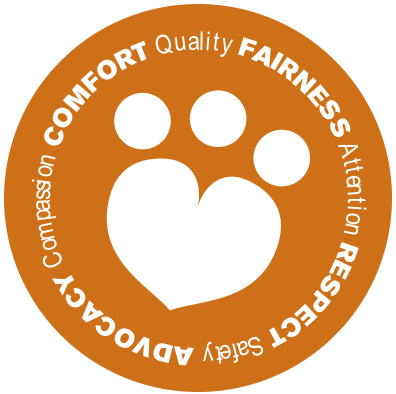 This logo reflects the values Pet Crossing stands for: Advocacy, Comfort, Fairness and Respect. You can rest easy knowing that your pet is cared for with Compassion, Quality, Attention and Safety. We will treat each patient as our own, with compassion, empathy and understanding. Patients will be called by name and referred to by correct gender. We will give full attention to every patient. We will take the time to examine them thoroughly, listen to their body language provide a comprehensive health assessment. We will be the voice for each patient under our care. Staff will hold each other accountable for the patient’s individual and changing needs. We will inform every client as to the best possible care for their pet. No patient should be worse for our care. We will do everything within our power to ensure the care we provide is performed with the greatest compassion, precision and judiciousness possible. Each patient will receive individualized care. Knowledgeable staff will provide care in clean, comfortable and safe surroundings utilizing well maintained equipment. Care will be provided in a consistent and timely fashion with appropriate follow up. Every patient will be kept clean, warm, and dry and any pain will be assessed and managed. Each will be fed, given water and allowed to urinate and defecate as medically indicated. Every patient will have freedom to move around their hospital area and socialize as appropriate. Every patient will be handled and spoken to gently. 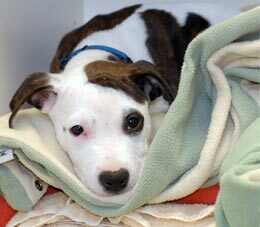 Every pet who comes through our door will receive warm greetings and as many treats as medically allowed. We will treat each client in the way that they would like to be treated. We will be compassionate, courteous and understanding. We will respect the decisions our clients make for their pet, themselves and their family. We will privacy and be mindful of their schedules. We will practice active listening at all times. We will dedicate the time needed to help each client reach their health care goals. We will communicate in a way that facilitates client understanding. We will collaborate with our clients in every aspect of their pet’s health care. We will provide health assessments, educational resources, recommendations and associated treatment plans. We will carry out the health care plan our clients have elected to the best of our abilities, based on a comprehensive knowledge of current medicine and each client’s individual needs. We will collaborate with other medical care providers to ensure continuity of care. We will recommend referral when appropriate and assist in the referral process. To ensure a comfortable experience, we will provide open conversation and a space in which our clients can feel at home. Every staff member will follow all rules and regulations (including but not limited to the employee handbook, OSHA and all city codes) to ensure the safety of themselves, other employees, patients, clients and the hospital itself. Every staff member will take ownership of the cleanliness of the hospital and grounds. All staff will clean as they go, never leaving a mess for someone else. The hospital will be kept clean and odor free. Floors will be kept dry. All sidewalks will be kept clean and safe. The plants and lawn will be maintained. All trash and poop will be picked up. All ice and snow will be removed. All equipment will be properly maintained to ensure optimal working order at all times. All drugs and medical supplies will be in stock and in date. Exam and treatment rooms will be properly stocked. The hospital will be welcoming and comfortable. Everyone at Pet Crossing has the duty to treat the hospital as they would a patient, client or fellow staff member. Every opportunity will be taken to recycle and reuse. Wastefulness will not occur. All lights will be turned off when not in use. To maintain a safe environment for staff, clients and patients, every staff member will ensure the security of the hospital. Keys and passwords will not be shared. Any security issues will be reported immediately. Confidentiality of all client, staff and hospital information will be kept. Every staff member will be responsible for the impression the hospital makes. Pet Crossing will be comforting and welcoming. The hospital will represent our mission statement. All employees will present and comport themselves in a professional manner. We will seek out opportunities to educate our colleagues, clients and the general public. We will provide opportunities for students to learn with us. Our online presence will focus on current knowledge and recommendations. We will also encourage networking among our clients and offer a platform for their engagement. We will provide recommended resources for counseling and other support services. We will stay up to date on current events and proceedings and be involved in policy issues that are relevant to our community. We will educate the members of our community on the changing status of these issues. We will make donations and provide services for causes we support. We will inform and educate our community on current issues in public health and safety. Every staff member will make a commitment to be thoughtful in their use of materials and make every effort to minimize waste. Our hospital grounds will be maintained with minimal use of chemicals, and kept free of debris. We recognize that our energy and attitude can make an immense impact on the emotions of others and commit to choosing positive attitudes. We are a full service American Animal Hospital Association (AAHA) accredited facility. AAHA accredits veterinary hospitals based on a list of nearly 1000 standards of care. Only about 15% of veterinary facilities in the United States are AAHA accredited.